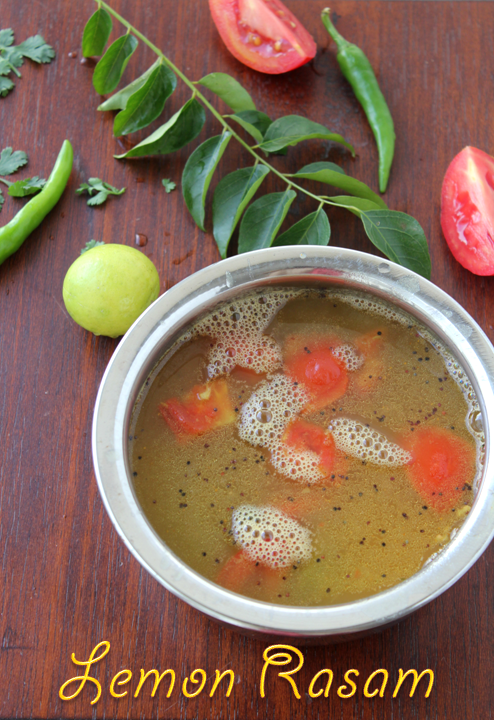 We South Indians especially Tamils make so many different kinds of "Rasam".Most of them are Tamarind based with Pepper and Cumin in it.Lemon Rasam is made with Dhal water and Lime juice for the sour taste.The Spice of green chillies and the ginger makes it more different than the usual rasam. This is my husbands favourite rasam but unfortunatley my kids do not like it.I usually make it on those days i make milagau kozhambu or vathkozhambu so that i avoid tamarind in the rasam and include some dhal. 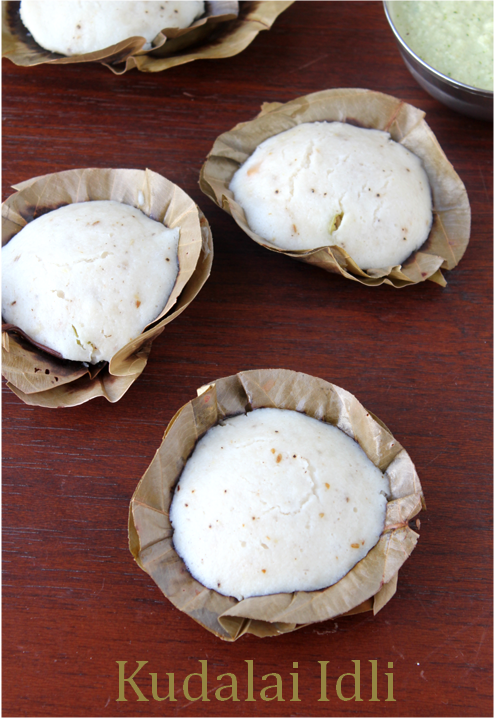 Kudalai Idli/Kanchipuram Idli is a variation to the normal idli.It is slightly spiced and steamed.They are the same idlis called Kudalai Idli when steamed in cups made out of dried leaves(in Tamil they call it the "dhonnai")and kanchipuram Idli when steamed in idli plates. 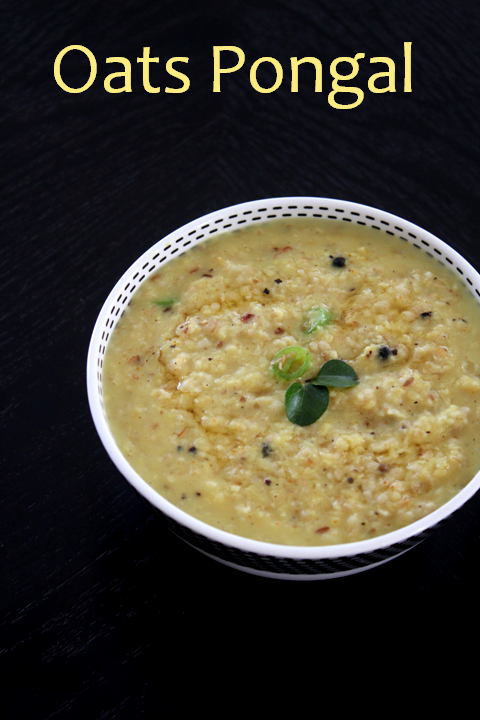 Oats Pongal is a savoury version of oats porridge cooked to suit Indian taste buds especially south Indian.It is same like our rice pongal in which we use oats instead of rice to make it more healthy.It is not only healthy it is very easy and fast to cook.Those who eat oats for breakfast regularly can try this one for a variety and a different taste. 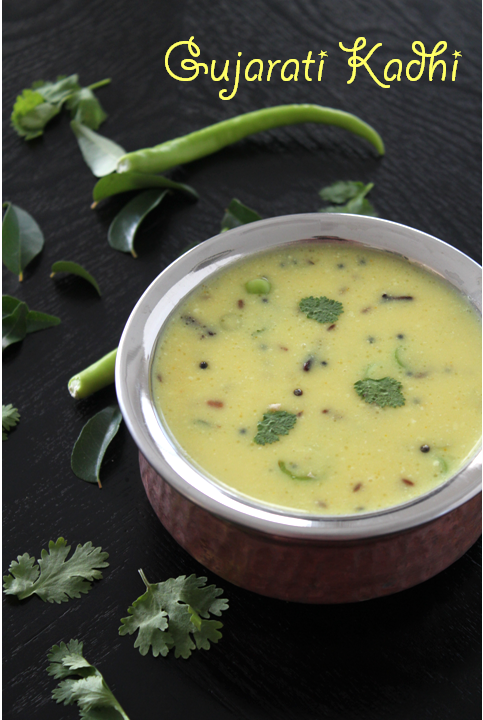 Gujarati Kadhi is a yogurt based sweet and spicy gravy.It is very simple and easy to make.It is usually served with rice and dal Khichidi.Kadhi is also made in different ways in different regions in India like rajastan and punjab.I like the Gujarati one the best.let us look at the recipe now. 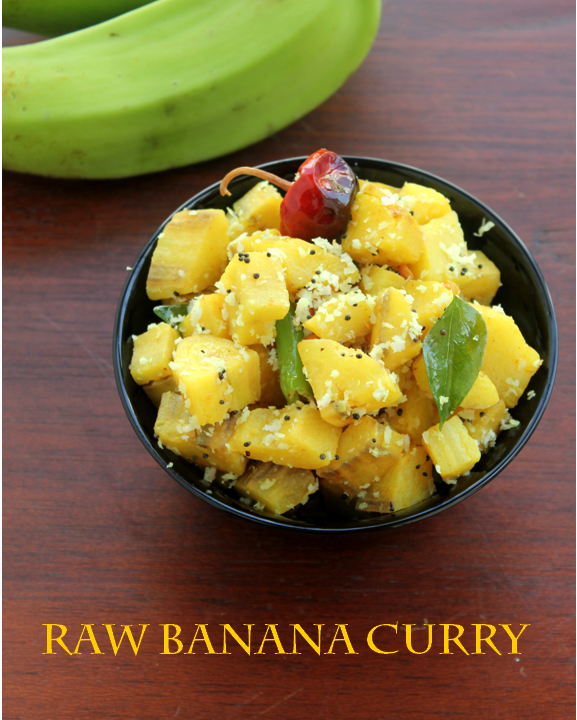 Raw Banana curry with a tinge of Tamarind is the curry that my mom used to make on amavasya day.In most of the Tamil homes i am sure they would make Vazhaikkai(raw banana) in a slightly different style.This one is perfect accompaniment for sambar or pitlai. 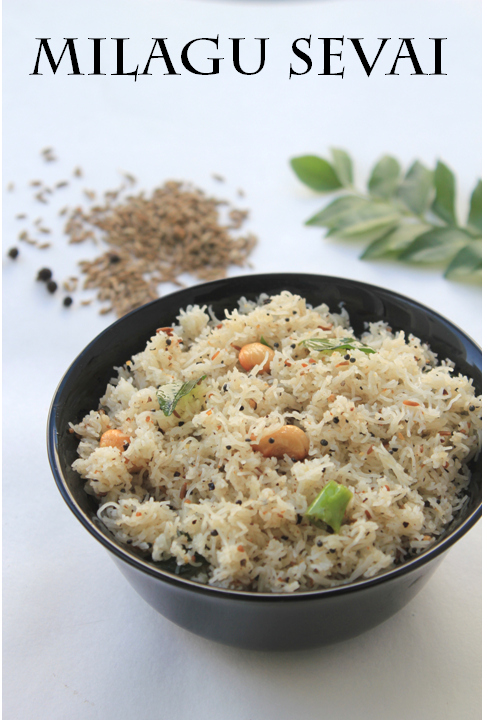 People make pulao in so many different ways and there are many recipes and versions to it.I also make it in three or four different ways depending on the time and availability of ingredients at home.Today i made some Channa masala so to go with it i made a mild pulao which looks more restaurant style one. 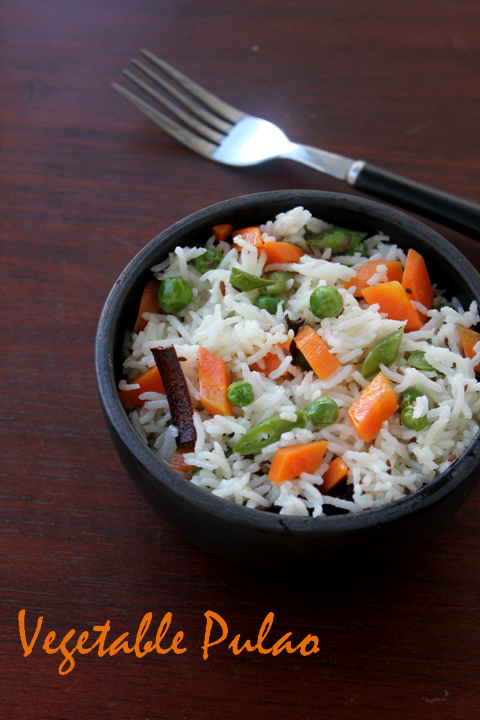 It is very simple and easy to make and requires very few ingredients.I cook the basmati rice separately and mix it with the vegetables in most of my pulao recipes.I feel the colour and taste is better this way when cooked seperate. 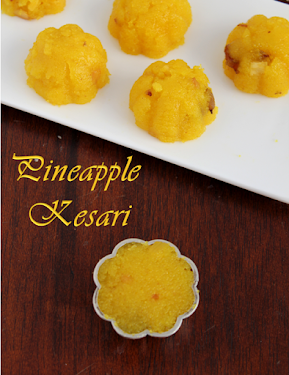 Milagu sevai or Pepper flavoured rice sticks is another way of flavouring rice sticks.It is very simple and easy to make.If you have the rice sticks ready it gets done in no time.When i really run out of ideas for evening snacks sometimes these easy,traditional and simple recipes comes in handy.Do try it!